The difference: The Luxury Well is a team of people that love and collect watches - we are not just another secondary market dealer but we want to forge long lasting relationships with our clients and provide genuine consulting and sales services that surpass even the most discerning collectors’ expectations. Today, we are offering a brand new and unworn Made in Germany Nomos Ahoi Datum (Date), Ref. 556, with all boxes and papers and full warranty. This is a genuine Nomos Glashütte watch and we guarantee authenticity. This is a rare watch for the ambitious entry level watch aficionado, impeccable in manufacturing and finish and a true statement piece for beginning and intermediate collectors. Current Retail price for this model is $4,360. The watch comes with the original Nomos black textile strap and with the original Nomos stainless steel tang buckle. 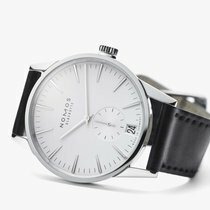 This timepiece is sourced directly from Nomos. The watch comes with full warranty and retail stamp from a US authorized retailer. PLEASE NOTE: UNLIKE CHEAPER OFFERS THIS WARRANTY IS AN AUTHORIZED RETAIL WARRANTY WITH FULL INTERNATIONAL VALIDITY. The watch is brand new and unworn and free from any blemishes. The exact condition of the watch can be seen in the pictures. The watch runs perfectly fine to specifications. Please make sure to also check our YouTube channel "The Luxury Well" for a video that shows the factory fresh condition of this watch in great detail. 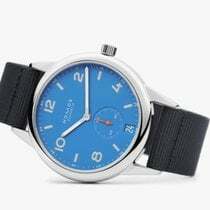 Description: A grand watch that has hit the big time: Ahoi! Although it looks dashing in a suit, its natural habitat is the water. This automatic watch holds firm down to 200 meters, the blue-black textile strap is waterproof, the crown guard protects from knocks and shocks. And the luminous indexes and hands tell the time even in the murkiest of deep-sea waters. The in-house automatic caliber DUW5101 boasts an outstanding winding rate and excellent accuracy; it is equipped with the patented NOMOS date mechanism and a great deal of tradition— such as beautiful polishings that are unique to Glashütte. The textile strap is tailor-made for NOMOS Glashütte in France. It sits comfortably on the wrist—and as elegant as it is, this strap is (of course!) also suitable for a swim. Our automatic timepieces come in an elegant leather wallet—the perfect companion for weekend trips and world tours. The black, full grain leather is wonderfully soft and protects your timepiece beautifully.